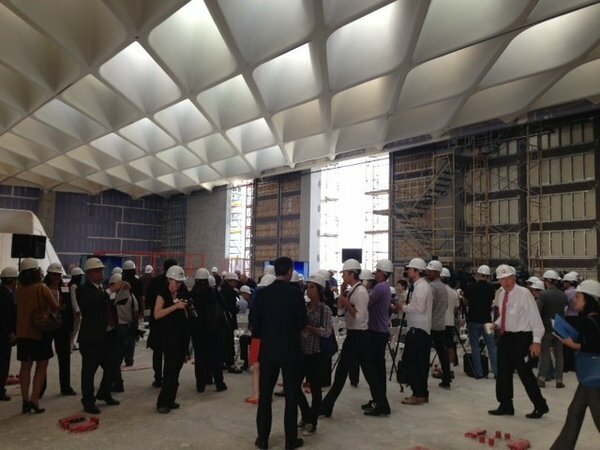 News about a recent hard-hat tour of The Broad (photo below) inspired me to visit downtown L.A. to see the Museum’s progress for myself. 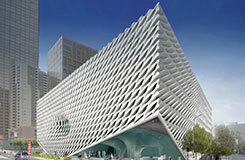 Eli Broad and his wife Edythe are building the estimated $140 million dollar museum to display their art collection. The Broad’s collection has over 2,000 contemporary artworks dating from the 1950’s to the present day by renowned artists such as Jeff Koons (artwork below), Andy Warhol, and Jean-Michel Basquit. If all goes well, The Broad museum will open late 2014, and Eli Broad just announced that general admission will be free. The most striking feature of the museum’s architectural plan is the “veil,” a honeycomb-shaped, white concrete, curtain that will cover much of the Museum’s exterior (rendering below). Taking cylinder-shaped glass elevator up to the third floor (my kids will love that), visitors will discover the museum’s 35,000 sq. ft. Exhibition Hall. The Hall’s soaring 23 ft. honeycomb ceiling, made of hundreds of rectangles, will allow natural light to filter in from the North to illuminate the artworks on display (rendering below). This all sounds incredible, right? 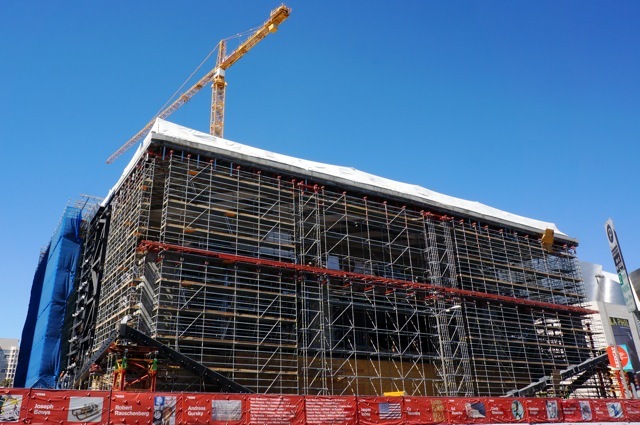 But from the street, the museum-in-the-making doesn’t look all that remarkable right now. It looks just as you’d expect most large-scale construction projects to look a this point; lots of scaffolding, and huge cranes. But I’ll tell you what did wow me. The Broad’s location on the corner of Grand Ave and 2nd Street, ideally situated among many prominent Los Angeles cultural institutions. 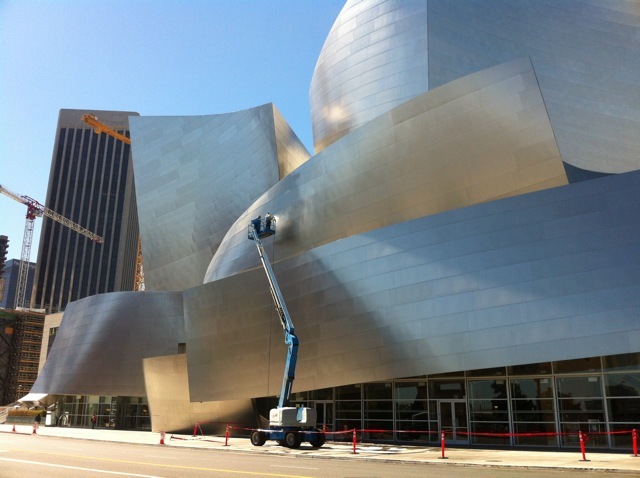 The Broad’s next door neighbor is the iconic Walt Disney Concert Hall, designed by Frank Gehry (photo below). I saw a cleaning crew sprucing up the Hall’s exterior for it’s 10th anniversary celebration. Other arts venues within a one or two block’s radius include the Dorothy Chandler Pavilion, the Ahmanson Theatre, the Mark Taper Forum, and RedCat (photo below taken from RedCat ticket office on 2nd). There’s even a performing arts school, the Colburn School, directly across the street. But the most exciting aspect of The Broad’s location for art enthusiasts like me is that it’s also across the street from the Museum of Contemporary Art (MOCA) on Grand (photo below). Imagine that. 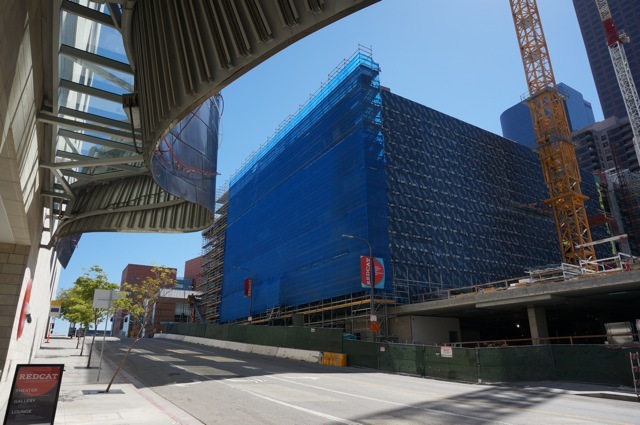 Two major contemporary art collections, open to the public, and within walking distance in L.A.
Driving home on the freeway, I couldn’t help thinking about how The Broad will enrich downtown L.A.’s already impressive arts corridor on Grand. My trip downtown also brought to life the idea that L.A. will actually have a new art museum, and I just can’t wait. To help you imagine what L.A.’s Grand Avenue arts corridor will look like when The Broad is finished, check out the animated video below. 1. The Broad media hard-hat tour September 17th. Photo by Deborah Vankin/Los Angeles Times. 2. Jeff Koons, Balloon Dog (Blue), 1994-2000. The Broad Art Foundation, Santa Monica. 3. Artist’s rendering of The Broad’s exterior. The Broad Art Foundation, Santa Monica. 4. Artists rendering of The Broad’s Exhibition Hall. The Broad Art Foundation, Santa Monica. 5. View of The Broad from the Colburn School on Grand. Photo by author. 6. The Disney Concert Hall on Grand. Photo by author. 8. 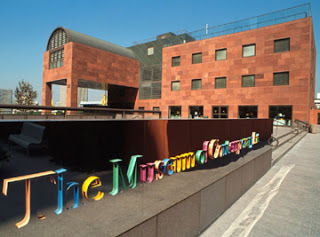 Museum of Contemporary Art (MOCA), Los Angeles on Grand. Photo by author. Posted in The Broad. Tagged as Contemporary Art Museums in L.A., Museum Architecture, new Broad Art Museum in L.A.